‘FAN N STAR’ Birthday support of BTOB's Hyun Sik and Peniel is held. How do we participate? [The Fact] An idol weekly website "FAN N STAR" operate by The Fact, has opened a support for the group BTOB's Hyun Sik and Peniel's birthday. 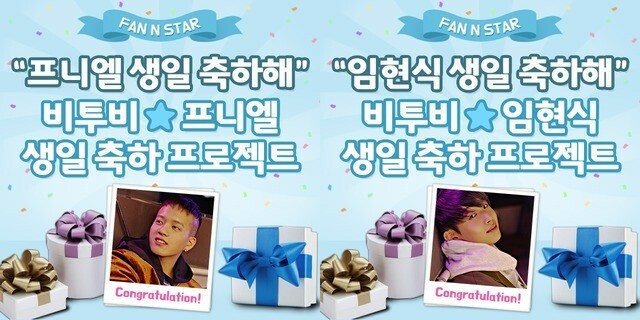 FAN N STAR started supporting BTOB's Hyun Sik and Peniel's birthday on the 8th. Fans are already rushing to participate in the electronic display board support, which is celebrate on March 7 and March 10. Hyun Sik and Peniel's support is organized by FAN N STAR, will show congratulatory videos through 43 subway stations of Seoul Subway Line 2 if they reaches 100,000 stars. When the number of stars reaches 400,000, the Seoul subway line No. 2 will advertise for a "travel bus" exclusively for foreigners. Also, if 600,000 stars are reached, the video will be screened through the CGV screen in Apgujeong, and if 900,000 are reached, Hongdae Multivision can be acquired, drawing attention from fans.